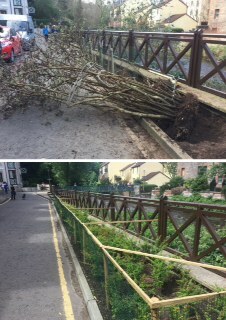 DVRL have just published the second phase of their feasibility study on scope and costings for proposed restoration work on the Dean Valley running from Dean Village to Stockbridge. You can find all sixty-seven pages of it (!) on their site here. Aardvark by Phyllis Bone. Photograph by Stephencdickson on Wikimedia Commons. From the late nineteenth century Dean Village hosted an artists’ studio: the Dean Studios found their home in the church that used to occupy the now-long-empty lot between Bell’s Brae and Belford Road. One of the many artists to work out of this space was Phyllis Bone (1894–1972); during her time in the Dean Studios she became the first female member of the Royal Scottish academy. Georgian Antiques is hosting the first ever retrospective of her work, to run for the duration of this year’s Festival. Walk the Walk are looking for amazing people to do help them do amazing things… Are you free on the 9th or 10th of June to support their Walkers at The MoonWalk Scotland? With over 30 roles available across 3 shifts, sign up now and be part of something awesome! Good news: the ramp on the Water of Leith Walk between Belford and the Haymarket steps reopened last week. It feels rock-solid and is wider than its predecessor: no more single file! Surveyors were seen this evening (4th June) on the closed path section just above the village. Are we about to see some long-awaited progress here too? National Cemeteries Week runs from the 12th to the 20th of May this year; we’re participating by running two tours of Dean Cemetery. More information can be found at the National Federation of Cemetery Friends. The section between Wester Coates (Haymarket steps) and Belford Bridge (Brittania Hotel) should reopen in mid May: they’re replacing the old wooden ramp at the bottom of the Haymarket steps. No news on the landslip between Damside and Belford Bridge: the Council remain tight-lipped due to ongoing legal proceedings. More information on the Trust’s blog. The Water of Leith Conservation Trust have recently updated their schedule of forthcoming events; these are many and varied, including talks on watermill conservation, the Pentlands and urban mushrooms; local literary, historical and architectural walks; cleanup events and a plant sale. Those interested can read more in the Trust’s blog. Previously… Scotland’s History Festival will take place in November. This year, it celebrates the centenary of the great Scottish heroine Elsie Inglis, who lies buried in the Dean Cemetery. She was a pioneering Scottish doctor, suffragist and founder of the Scottish Women’s Hospitals. 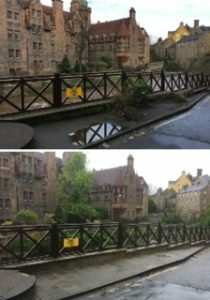 The Dean Village Association is running several events in support of the festival; they are listed in our calendar. Booking is essential for these events. More information on Previously… itself may be found at http://www.historyfest.co.uk/. As well as new planting, the western garden area has been transformed from an untidy and tired garden space into a new paved viewing area, and the eastern area replanted with a Berberis hedge. 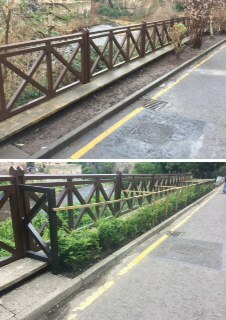 James Gibb, the local factors, have added their weight to the initiative by replacing the wooden fence by the riverside. Many other changes are taking place. 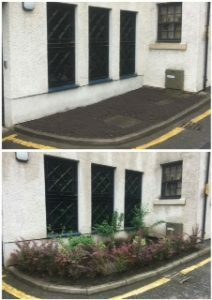 Congratulations to Hawthornbank residents for demonstrating an imaginative and creative commitment to enhancing their local environment. The Schoolyard, situated at the junction of Dean Path and Damside, has been developed by the City of Edinburgh Council as a play area for children and a rest area for visitors and residents. An Information Board has been provided which describes the history of many of the buildings and features of Dean Village.